PCH, Cheap Turbo Porsche Edition: Mystery Turbo-ized '77 911 or Gutted '78 930? 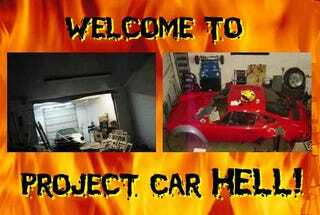 Welcome to Project Car Hell, where you choose your eternity by selecting the project that's the coolest... and the most hellish! We saw the '49 Rolls Silver Wraith hold its own against the obviously unbeatable burn-victim Countach, gaining a respectable 41% of the vote in yesterday's Choose Your Eternity poll. Today we need to contemplate a couple of Porsche 911 projects; sure, we see 928s here on a regular basis (for obvious reasons), but it's pretty tough to find a real 911 for a PCH-worthy price. Today we've done even better, with a pair of turbocharged 911s, each priced in used-Honda-Civic territory! When most of us try to sell a car using an online classified advertisement, we do our best to take a useful photograph or two and write some sort of description laying out the good and bad facts, if only to avoid having to answer the same questions from every single potential buyer. When you're trying to sell a Porsche 911, this becomes way more important, because 911 zealots aficionados want to shoot you in the face with a Luger insist on knowing all the facts about a car for sale. Yes, they pursue their all-consuming obsession hobby with Unabomber-like focus great enthusiasm, so you'll need to craft your Craigslist ad accordingly. However, some sellers don't realize this, and the guy or gal with this 1977 Porsche 911 Targa Turbo (go here if the ad disappears) was a little sparse with the words and images. We've got one photograph of some piles of crap piled in a driveway with a vaguely Porsche-ish shape in the background, apparently shot at midnight, from across the street, using a cellphone camera. But hey, not everyone can figure out this complicated photography thing, so that's where you paint a vivid word picture to compensate for the uninformative image: "Salvage title, Runs, Needs work!!" That's it. Is it a genuine factory turbocharged 930? A super-sanitary aftermarket job? A Rube Goldberg junkyard nightmare involving PVC pipe, duct tape, and six turbochargers hacksawed off Chevy Sprint Turbo engines? We can't say! But it's only $4,500, so head on out to Clackamas County! Thanks to Commodore356 for the tip. Come on now, we know that a really rabid devoted Porsche stalker buyer needs a factory-correct car, because nobody but the monocle-wearing, riding-crop-brandishing white-coated sadists engineers in Stuttgart know how to build a genuine oversteering death machine performance car. You've got to have a real factory 930 chassis number if you want to go claiming 930 ownership, and that's that! Fortunately, the seller of this 1978 Porsche 911 Turbo understands how that works, and he or she has a stripped-out shell great starting point for a life-destroying really fun restoration project. We don't know what the reserve price might be, but the top bid is under 12 Benjamins. Maybe it will go for $1,500! The seller keeps revising, adding, and deleting description as the auction progresses, so it might be worth checking back later to see if any new facts appear or disappear. It looks like you get the glass, some suspension components, and a reasonably unrusty body. How about putting a WRX engine in that thang? Hey, y'all, watch this! Mystery Targa Turbo or Stripped 930?